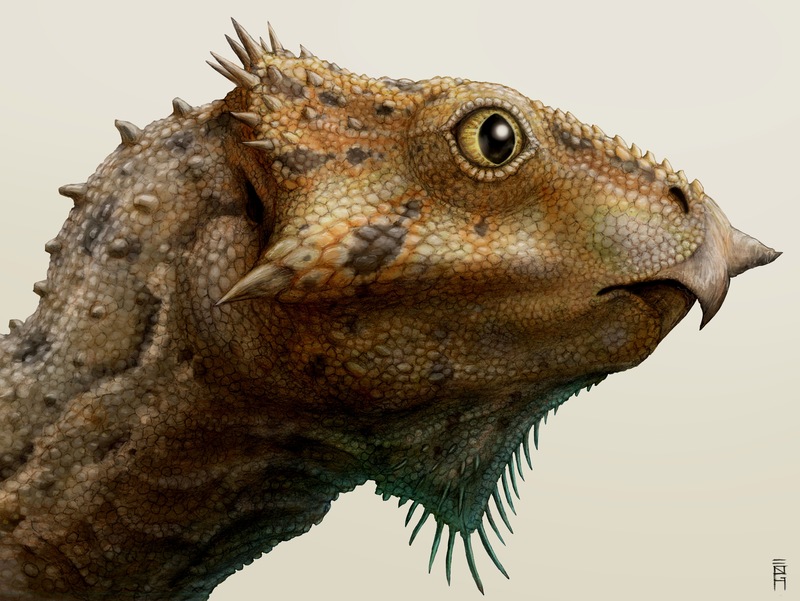 Today sees the description of Aquilops americanus (“American eagle face”), a new basal neoceratopsian from the Cloverly Formation of Montana, by Andy Farke, Rich Cifelli, Des Maxwell, and myself, with life restorations by Brian Engh. The paper, which has just been published in PLOS ONE, is open access, so you can download it, read it, share it, repost it, remix it, and in general do any of the vast scope of activities allowed under a CC-BY license, as long as we’re credited. Here’s the link – have fun. 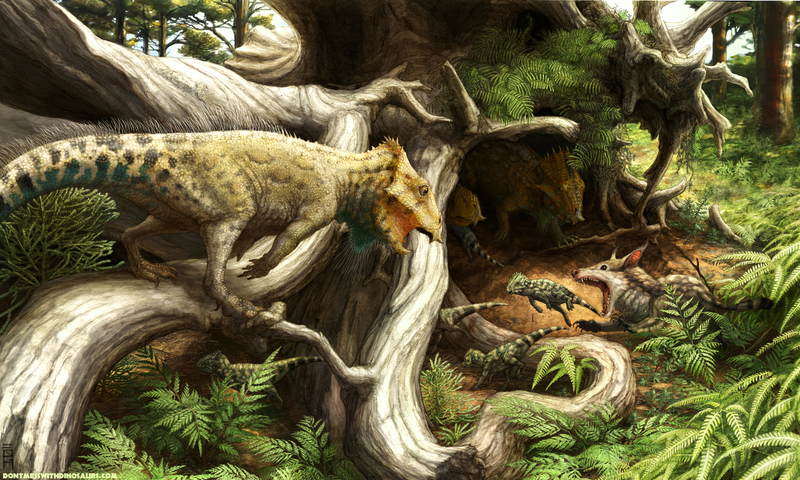 Obviously ceratopsians are much more Andy’s bailiwick than mine, and you should go read his intro post here. In fact, you may well be wondering what the heck a guy who normally works on huge sauropod vertebrae is doing on a paper about a tiny ceratopsian skull. The short, short version is that I’m here because I know people. 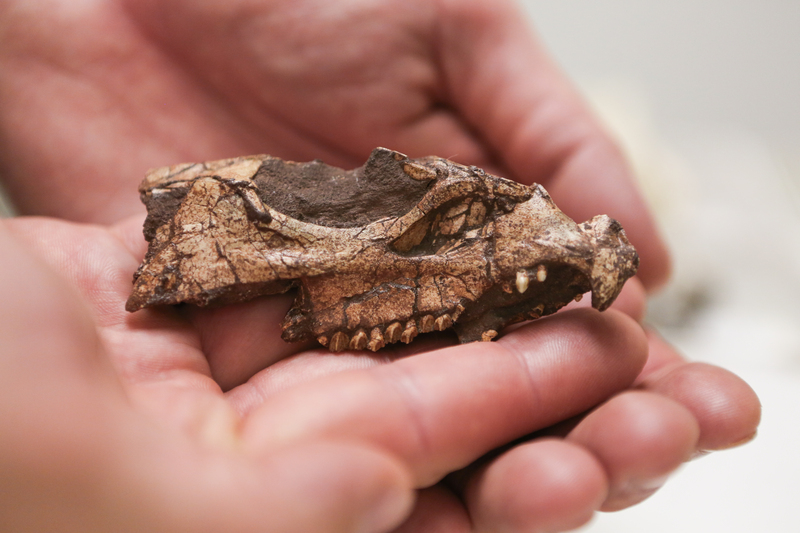 The slightly longer version is that OMNH 34557, the holotype partial skull of Aquilops, was discovered by Scott Madsen back in 1999, on one of the joint Cloverly expeditions that Rich and Des had going on at the time (update: read Scott’s account of the discovery here). That the OMNH had gotten a good ceratopsian skull out of Cloverly has been one of the worst-kept secrets in paleo. But for various complicated reasons, it was still unpublished when I got to Claremont in 2008. Meanwhile, Andy Farke was starting to really rock out on ceratopsians at around that time. For the record, the light bulb did not immediately go off over my head. In fact, it took a little over a year for me to realize, “Hey, I know two people with a ceratopsian that needs describing, and I also know someone who would really like to head that up. I should put these folks together.” So I proposed it to Rich, Des, and Andy in the spring of 2010, and here we are. My role on the paper was basically social glue and go-fer. And I drew the skull reconstruction – more on that in the next post. One of the world’s smallest ceratopsians meets one of the largest: the reconstructed skull of Aquilops with Rich Cifelli and Pentaceratops for scale. Copyright Leah Vanderburg, courtesy of the Sam Noble Oklahoma Museum of Natural History. Anyway, it’s not my meager contribution that you should care about. 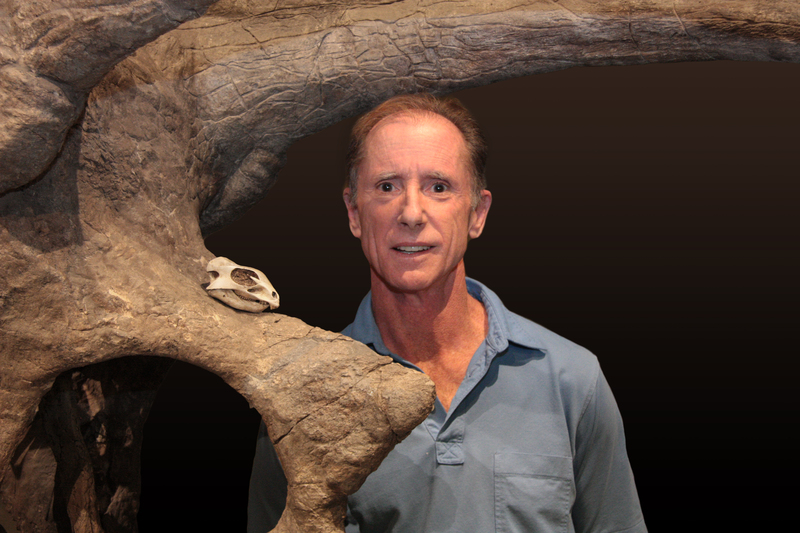 I am fairly certain that, just as Brontomerus coasted to global fame on the strength of Paco Gasco’s dynamite life restoration, whatever attention Aquilops gets will be due in large part to Brian Engh’s detailed and thoughtful work in bringing it to life – Brian has a nice post about that here. I am very happy to report that the three pieces Brian did for us – the fleshed-out head that appears at the top of this post and as Figure 6C in the paper, the Cloverly environment scene with the marauding Gobiconodon, and the sketch of the woman holding an Aquilops – are also available to world under the CC-BY license. So have fun with those, too. Finally, I need to thank a couple of people. Steve Henriksen, our Vice President for Research here at Western University of Health Sciences, provided funds to commission the art from Brian. And Gary Wisser in our scientific visualization center used his sweet optical scanner to generate the hi-res 3D model of the skull. That model is also freely available online, as supplementary information with the paper. So if you have access to a 3D printer, you can print your own Aquilops – for research, for teaching, or just for fun. Cloverly environment with Aquilops and Gobiconodon, by Brian Engh (CC-BY). Next time: Aquilöps gets röck döts. completely, totally, absolutely WRONG branch of the tree! oh, and you do realize that the pics don’t show, that when I click the link the page tells me I need to be a member of the blog and logged in? Yeah, that should be fixed now. I had created this post in a private blog I set up just for that purpose, so I couldn’t accidentally hit ‘publish’ instead of ‘update’ and break the press embargo. I copied and posted it over to SV-POW! at go time, not realizing that stupid WordPress would keep the images private since that’s where I first uploaded them. Oh well, better a few minutes late than early. And about your first comment…I know, I know. I hang my head. very well done, Mathew and colleagues! That’s what I usually do as well, but I thought I’d try a new method this time. So much for that. And, thanks again for the kind words! I just want to mention here that Matt is significantly downplaying his contribution to this project in this blog post. Not only did he connect people, reconstruct the skull, and make body mass calculations, but dude came through with about 5000 ideas about the animal’s behavior and biology, and the discussions that resulted were integral to our current ideas, descriptions and depictions of this animal. I’ve talked with a few people who can talk dinosaurs, and a few people that can talk biology in general, but this dude got all the bases covered + awesome. Big respect. And thanks again for bringing me in. What, I can 3D print my own skull? Holy crap. I need to find a 3D printer!